Tags: Ari Engel, Bicycle Casino, Los Angeles. Posted on Tuesday, April 03, 2018 by "T". A $160 buy-in $1 millon guaranteed event at the Bicycle Casino in Los Angeles (Event #25: Mega Milions XVIII Quantum) attracted a massive field of 6,087 players to more than double the initial guarantee! The event started on March 16 and finished on March 29, with $160 and $550 buy-ins for Day 1 flights and a $4,300 direct buy-in for Day 2. At the end of it all it was Canadian poker pro Ari Engel who had all the chips for a $315,142 payday. He also received a trophy and a $4300 ticket to the next Mega Millions event. This was Engel's third largest live tournament score to date and he now has $5.8 million in total live earnings! Despite so much success and money earned playing live tournaments in the past decade, Engel continues to play small buy-in events (with massive fields) with great success! Something not that common for players of his caliber these days! It proves that one can be a very successful poker player without playing high roller and super high roller events! Barry Greenstein: "sometimes finding the best game means traveling"
15 comments for "Ari Engel Outlasts Massive Field To Win $315,000! " A balanced player who does not want to throw the money for high roller and super high roller events. There is nothing abnormal. This player knows he has the potential and goes into small games but with great prizes. Probably if there were satellites for that he would have played and not spend much money. It's the best in this way and not throw money on big tournaments. Big tournaments have to be played with satellite qualifiers. Congratulations to Ari Engel on winning this Mega Millions tournament. Winning $315.000 from only $160 buy-in is a very nice achievement. Reminds me online tournaments with lots of players and decent prizes for tops. I like his bankroll management. 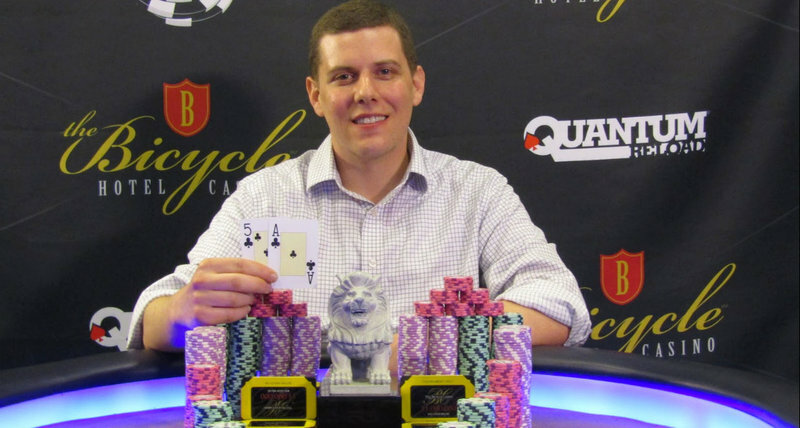 Massive congratulations must go out to Canadian poker player Ari Engel on being crowned champion of the US$1 million guaranteed event. His tireless efforts and dedication have come to fruition. I wish him the best of luck in all his future endeavors. this I call great win for small amount!if you played from first day,you had only 160 $ buy in and you win 315 K dollars!very nice win from over 6000 players!as I see he have lot of winnings at live tournaments and he will probably do it again! A balanced player who does not want to throw the money for high roller and super high roller events. There is nothing abnormal. Very few pros have their own money 2pay for those high roller events. 80% of them are either backed from the getgo or selling percenteges so they could afford being there. The trick is that you need to think otherwise once you check their twitter/insta accounts so they could sell you on the lifestyle but millions in lifetime tournament earnings not necessery means millions on their checking accounts as well. This dude is just keep being honest. well bowie1984 you are right about this!we cant know how many players sell their shares from winning,just to get money for buy in on big tournaments,especially when big tournaments are!but this was not a big buy in and great payout for everybody! Of course bowie1984. These millions decrease because are annual fees, personal life expenses, taxes for tournament entries etc. In any case, it is better to earn this money. What they gather there is their total earnings with live or online poker games and the rest is not calculated because they have no way to know the situation of their bank accounts. yeah kinda interesting to see this dude with almost 6 millions in his pocket from various poker actions online and offline still keeps playing tournaments with 160 dollaros buyin. surely that's one safe br management strategy if you ask me. lot of money from winnings on live tournaments or online poker goes on buy in,travel,other expenses and others losses!its not all profit!who know how many live tournaments with big buy in,these players didnt come till prize pool!